The development of passenger cars that do not require a human driver behind the steering wheel is well-advanced. This development is not receiving much opposition from people who hope that such technology will somehow make urban travel by car in particular more appealing. It is not seen as destroying jobs either, although a taxi driver may disagree with this conclusion. 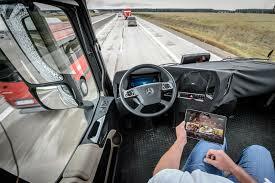 What is given less media space is that in the road transport industry automated long haul trucks are already a reality in the US and Europe and likely to hit Australia soon. According to real estate firm CBRE in a report "Automated Technology Driving Change in Real Estate", the automation of road transport will also effect warehousing and distribution workers. CBRE predict that it will result in the development of massive warehouses outside cities adjacent to major highways and these warehouses will be highly automated as well. The impact on jobs will be significant at a time when full time jobs are becoming a prized possession as part time and casual work grows at a steady rate. These trends in technology within the transport and warehousing industries are likely to see more big struggles by workers fighting for their livelihoods in a similar way that the trend to outsourcing and labour hire by multinational corporations has given rise to the CUB dispute. Neither major political party nor parliament will stop these trends. However the working class will have no choice but to find a way to overcome these attacks on their very existence as workers.